He looks like a drowned rat. But clinging to his very own surfboard, this is simply a pet exploring his wild side. 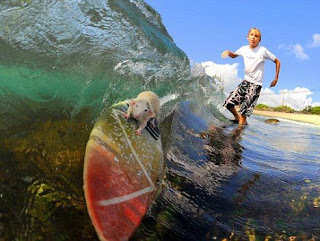 Tofu, as he is known, and his 14-year-old owner hit the waves twice a week at their local beach in Hawaii. 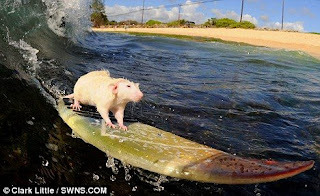 Along with his fellow rat Fin, Tofu catches waves of up to 4ft and even rides tunnels of water known as 'tubes'.